PLEASE NOTE: We now carry these charms in 4 different sizes. CC4S, CC8S, and CCMS are new styles. 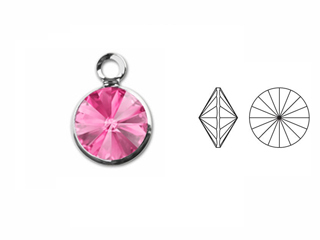 We wholesale Swarovski channel set faceted crystal birthstone charms. We are one of the largest supplier of these and sell them at various volume level discounts. You can buy these by one birthstone or set of 12 birthstone months. Just remember that more you buy more you save. We carry a large stock of these at any given time and get frequent shipments of these. Silver Plated and Gold Plated Charms are ideal for making personalized birthstone jewelry. These are an inexpensive way to add high quality faceted Swarovski birthstone color crystals to your jewelry be it silver tone or gold tone. These are also known as Swarovski 57700 series Channel Drops. Our Swarovski Crystal Channel Drops Birthstone Charm enhances personalized stamped jewelry and charm bracelets. Add Swarovski Crystal Drop Charms to your hand stamped pendant. We carry Swarovski birthstone channel links such as also. These are also known as Swarovski Birthstone connectors. If you are looking for larger size birthstone charms, be sure to checkout our TierraCast Birthstone Stepped Bezel Charms . If you are looking for Sports Team Color Charms, be sure to checkout our TierraCast Your Sports Team Collection .